I wrote on Monday that Jeremy Corbyn’s chances of winning the Labour leadership election were significantly better than the odds were implying, but that without published polling data it would be impossible to assess with any great accuracy. I wasn’t too hopeful that we’d get any, but fortunately YouGov has stepped up to the plate (and kudos to them for doing so) with a representative survey for the Times. Corbyn would come in 17 points ahead in the first round, 15 in the second and 6 in the final round against Andy Burnham. 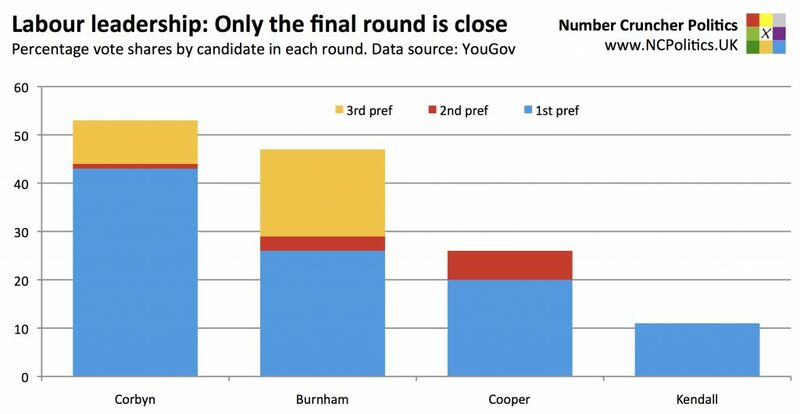 The transfers are interesting – Kendall’s split 67 for Cooper, 26 for Burnham and 7 for Corbyn, while Cooper’s break 69-31 in favour of Burnham. Polling a small electorate like a party membership is notoriously difficult – getting a representative sample is even harder than usual. In 2010 YouGov were close on the overall result but underestimated David Miliband among the members, who are now crucial under the “one member, one vote” system. But this time, it seems YouGov has dealt with some of the usual problems through some clever weighting using Labour’s own data – crucial, as demographic weighting targets need to be based on party membership, not the general electorate. Looking at the tables, one slight concern is that younger members (under 40s and especially under 25s) are undersampled and have had to be weighted up substantially.  This is essential to achieve a representative sample, but not without problems. Though there are extra caveats around crossbreaks, there doesn’t seem to be any great variation in support across age brackets. But the results do support the idea that newer members are more left-wing – Corbyn’s support rises in line with recency of joining Labour, Kendall’s and Cooper’s fall, while Burnham’s is roughly constant (though the order of the candidates is the same in all cases). Those that voted for Ed Miliband in 2010 split 56% for Corbyn. Former David Miliband voters split fairly evenly across the 2015 candidates, with Burnham and Cooper slightly edging the others. Corbyn is more popular with women than men, Kendall more popular with men than women, while Burnham and Cooper have no significant gender split. On the criteria (of which there’s full list in the tables), supporters of the various candidates do concur on a number of them. But on others, there are huge differences – 63% of Kendall backers feel it’s important to understand what it takes to win an election, compared with just 10% of Corbyn supporters (and 27% overall). 47% of those intending to vote for Kendall think it’s impotant to move the party to the centre compare with 1% of those choosing Corbyn (and 9% of all respondants). Remember too that this is just one poll, so it has a margin of error. While the 53-47 result in the final round is right on the limit of the MoE, I’d still be very cautious for all the reasons above – this is not a “normal” poll. And voting intention can of course change before the envelopes are sealed. But as things stand, the race looks wide open.